Aimed at those who have little or no experience of the banjo but have roughly a year’s experience playing another fretted stringed instrument e.g. guitar, mandolin, ukulele, tenor banjo. Please note, this short course will look specifically at clawhammer or frailing 5-string banjo, as opposed to tenor banjo (4 string) or bluegrass/Scruggs style/three finger playing. Learn the basic rhythm hand technique, exploring the banjo and old time style playing and working on a few simple tunes. Ideally you should have a 5-string, open back banjo. 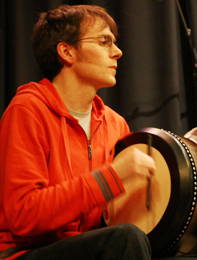 For people already familiar with the basics of the bòdhran, a traditional Irish percussion instrument now very popular in Scottish and wider traditional music circles. The course will cover core reel, jig & slip jig rhythms. You will also look at more advanced tipper techniques, using the left hand for pitch and timbre and different styles of accompaniment. Beginners’ Traditional Harmonica playing. You will need a Tremolo Harmonica in the key of D (not C) e.g Hohner Big Valley D (costs around £15-£20). D tuning will allow players to play tunes with other instruments in the key of D. The course will cover: the major scale, 1st position; an introduction to 2nd and 3rd position playing, and tongue blocking technique. You will learn to play 2 simple traditional tunes with an introduction to other tunes.